Derived from the 12th Century Middle English 'huckestere', the surname is job descriptive for a medieval travelling merchant, although the name applies specifically to a woman. In later years as society became urbanised, travelling merchants, male or female, came into disrepute; this was not so originally, when travelling merchants provided the only source of news for the majority of the populace. The name development included Amable la Hukkestre 1310, Colchester,and later Richard Huxster 1662, The Hearth Tax Returns, Essex. 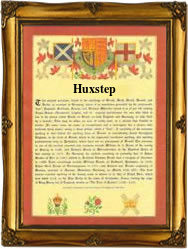 The name has other alternative spellings including Huster, Huxster and Huxstep. Amongst the recordings in London is the marriage of Elizabeth Huxstep and John Covell on October 26th 1774, at St. Lawrence Jewry and St. Mary Magdalene, Milk Street, London. The first recorded spelling of the family name is shown to be that of Lecia La Hucstere. which was dated 1277, in the Abbey of Elyi Suffolk. during the reign of King Edward 1, known as the Hammer of the Scots. Surnames became necessary when governments introduced personal taxation. In England this was known as Poll Tax. Throughout the centuries, surnames in every country have continued to "develop" often leading to astonishing variants of the original spelling.